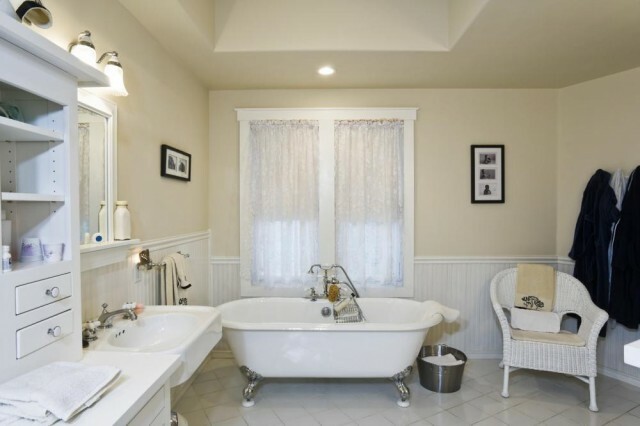 Remodeling your bathroom can be as simple or as detailed as you want it to be. If you are on a budget, there are simple ways to remodel your bathroom without going broke. Here are five tips to improve your bathroom on a budget. A simple way to give your countertop a new, fresh look, is by adding tiles. This will save you tons of money on buying a whole new slab for your countertop. It’s a simple DIY project and all you need is tiles, caulk, and a little paint if you want to take it a step further. Replace or refinish bathroom fixtures to give the room an updated look. You don’t need to completely replace those cabinets or showers and tubs, simply refinish them with a new glaze, or replace the hardware on your cabinets. Once this is done, your bathroom will look fresh. Stain or paint your floors instead of replacing them. If you have wood floors, it’s really simple to add a fresh coat of a stain or even paint. A fresh coat of paint can do wonders for sprucing up your bathroom. Choose a light color to make the room look open and large. You can also take this a step further and match the paint color of your walls with the color of your floors. This will give the room a monochromatic look, and it creates a more dramatic effect. Turn the focal point of the room onto a large, elegant chandelier. By choosing one large piece that draws attention to it, this will make the room seem like you have done more work than you actually have. You can purchase beautiful chandeliers for relatively low prices at your local hardware store.